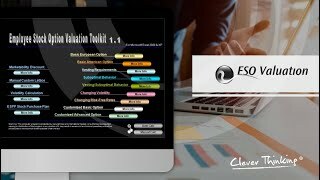 The ESO software was used by the Financial Accounting Standards Board (FASB) to create the valuation models in FAS 123. Decision makers can model share-based compensations, exercise behaviour, forfeiture rates, blackout periods, marketability discounts, and changing inputs over time (volatility, dividend yield, risk-free rate, among other multiple inputs) for managerial alignment, expenses optimisation, FAS 123 requirements, and auditing and compliance. It allows decision makers valuing employee stock options (ESO) and their expenses associated using the same software the Financial Accounting Standards Board (FASB) uses to generate its FAS 123R examples and recommendations. ESO helps to combine thousands of assumptions and inputs to compute the fair value per option; for example: share options granted, employees granted options, expected forfeitures per year, share price at the grant date, exercise price, contractual terms (CT), interest rate, and expected volatility, and so forth.